Not only does it serve as an important safety feature at your property, it enhances the beauty of your elevated living area, balcony, staircase, decking or mezzanine. Balustrades are becoming increasingly popular and many people choose to install balustrades for their visual appeal indoors and outdoors. At Keble’s Trading we stock both glass balustrade and wire balustrade panels, fittings and components. With every frameless glass balustrade, it is important to have the right glass balustrade brackets and glass balustrade fittings to truly complement the overall look. We offer a solid-quality selection of stainless steel fittings to help you enhance the design of your glass balustrade. For example, you will find rectangular capping tubes and fittings, handrail brackets, glass stand-offs, lag screws, threaded rods, glass clamps, squared slotted tubes and fittings, round slotted tubes and fittings, spigots and glass fittings and brackets. For a wire rope balustrade, we stock various types of wire rope in both standard grade (304) and marine grade (316) stainless steel. The latter grade of stainless steel has corrosion resistant properties and is suitable for locations closer to the seaside. We also sell stainless steel turnbuckles, bottlescrews, hydraulic terminals, swage studs, eye bolts, lag screws, wire rope fittings, tensioners, terminals, post anchors, and wire rope fittings and tools. - Ask questions if you are unsure about anything related to the balustrade. 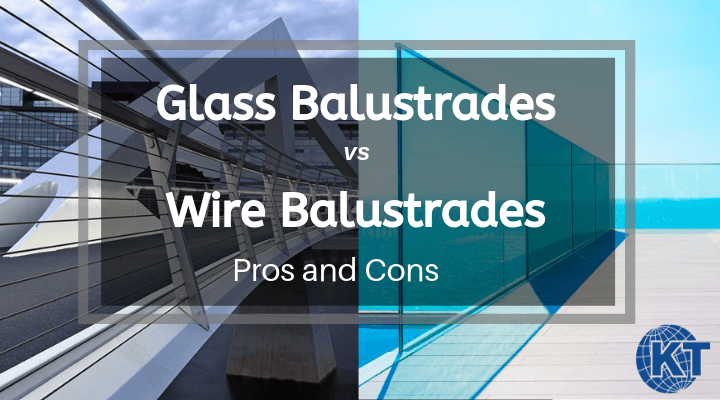 Here are 15 factors to consider when choosing either a glass balustrade or wire balustrade. When you choose either glass balustrade or wire balustrade it needs to complement the overall design of your property. Glass balustrades look clean as they blend in with the surrounds. Wire rope balustrade can often obstruct the environment. However, this depends on how subtle the wire ropes are (i.e. the thickness of the ropes and how far apart they are spaced). Wire rope balustrades offer a more industrial look and feel, especially with the metallic overtones. Glass balustrades suit various decors and can blend in well with both traditional and modern styles and colours. Wire rope balustrades would suit wooden and metallic finishes in the property such as a decking at home or mezzanine in the office. Your balustrade needs to be visually appealing and eye-catching. Glass balustrades offer uninterrupted views of your surrounds and allow light to filter through the living space or office space. Frameless glass balustrades can offer panoramic views too which help to provide wide-angle visuals or the nearby environment. Wire balustrade also allows light to enter the area, but the wire ropes can obstruct views and make the area look and feel smaller. While the glass panels can be easily cleaned with a lint-free cloth, wire ropes often require a brush for cleaning especially when cobwebs and dust sit on the ropes. Both glass and wire balustrades offer safety features. While glass panels completely cover the opening, wire balustrade can still allow objects to pass through. It is crucial that installation regulations are reviewed to ensure your new balustrade is compliant with local laws. Some often note that wire balustrades can be dangerous because if someone trips and falls close to the balustrade, a part of their body could become caught between the wire ropes. Also wire balustrade might not be child friendly as it may have sharp edges and toys could fall off the side. However, we do stock nylon and/or PVC coated wire ropes to provide a softer feel if you require. Glass panels offer protection against wind and noise. The panels can also be tinted to offer protection from the harsh UV rays from Australia’s sun. While some prefer the wind to be blocked out from the living area or office space, wire rope balustrades keep the area cool as it allows fresh air to circulate. Depending on how high the balustrade is, this could make a difference to the temperature and the indoor or outdoor environment. Glass balustrades can also help to reduce noise levels inside as it rebounds sound waves away from the property. Glass balustrades and wire balustrades both have positives and negatives in relation to maintenance. While glass balustrades are easy to clean on the inside, they might be difficult to clean on the outside. Remember both sides require cleaning (so be carefully cleaning the panels from the outside especially at a height!). Wire rope balustrades may require adjustments now and again and should be cleaned with a soft damp cloth to remove any salt or dust deposits. Both wire balustrades and glass balustrades are equally resilient and durable. Their inherent features and characteristics make them resilient and strong structures indoors and outdoors. If the glass panels have been inserted correctly and clamped accordingly, they should maintain their configuration for a long-time (i.e. the panels should not slide out of place). On the other hand, while the wire ropes may need to be adjusted and tightened over the years, if they are installed appropriately they should retain enough tension and their shape (i.e. they should not sag). The installation requirements for both glass and wire balustrades differ. While the frame structure might be the same, installing glass panels and wire ropes require different skills, tools and equipment. At Keble’s Trading, we stock all parts and tools to help get you going with your next project. We can guide you in the right direction with your queries and point you to suitable experts if required. Remember to check with your local council if a building permit is required before proceeding with the installation. All regulations and standards will need to be met, so it is best to consult with a builder, installer, architect, building inspector, or building surveyor to safe guard your balustrade and handrail building plans. The cost of glass balustrade and wire balustrade will differ. Depending on the size, design and complexity of the balustrade, cost will always be an important consideration. Cost alone should not deter you or discourage you from creating the balustrade of your dreams. You home or business is an expensive investment and it is worthwhile spending a little extra to have a fixture that is functional, exquisite and appealing. At Keble’s Trading, we stock parts and tools at reasonable rates and we will help you when you come to us with your project requirements. Different installation standards apply to glass balustrades and wire balustrades. Before you consider installing glass or wire balustrade, make sure you are familiar with some rules. These rules are not exhaustive and there are other resources which you should consider. A qualified and professional builder or architect will help guide you along the way. Especially in commercial settings, a compliant balustrade is important for staff occupational health and safety. Make sure you seek appropriate advice if you are unsure. For large scale commercial projects, a construction and building expert is recommended. Both glass and wire balustrades offer security features. You can seal your living or office space completely, or have a fitted door or gate (with a lock if you choose) to allow for pedestrian access through the balustrade. Balustrades can also offer added privacy as you can tint the glass or block the balustrade with pots or other furniture. This helps to keep your office space or home secure from intruders and the external elements. Make sure you consider what options you have. Glass balustrades and wire balustrades are more popular than wooden balustrades or plasterboard balustrades. These latter two options are on the verge of being outdated and tend to be installed because they are comparatively cheaper. However, as mentioned above, it is better to install a visually-appealing balustrade because it will enhance the value of your property or commercial space and make the area look and feel grand. You can customise the look and design or your wire balustrade or glass balustrade. Whether you are after round edges or modern straight lines, our glass panels and balustrade accessories allow you to personalise your new installation accordingly. Glass panels can be cut into various shapes to suit your specifications too. The options are endless with glass or wire balustrades. At Keble’s Trading, we stock premium glass panels, wire ropes, fittings and parts that have been fabricated from reliable materials. Bring your requirements to us and our team will be happy to assist you with the right supplies for your project. From toughened glass panels as small as 400 mm x 1200 mm through to larger options that measure 1200 mm x 1200 mm, or various lengths and compositions of stainless steel, galvanised, PVC coated or nylon coated wire ropes, you are sure to find something in our range that suits your requirements and budget. As you decide on how your glass balustrade or wire balustrade will look, remember to engage a professional architect or builder. While you may think that your design is ideal, an installer, fabricator, builder or architect might observe structural difficulties with your installation. Not only does your balustrade need to look exquisite, it must also be functional and structurally safe. Both types of balustrade offer customisable options, but it is important you check your property to ensure no other structural and building improvements or modifications are required. This is critical to ensure you receive final sign-off from an appropriate building inspector. A functional glass balustrade or wire balustrade is ideal. Think about the height of the balustrade, the thickness of the glass panels, the spacing between the wire rope inserts, the number of posts and more. At Keble’s Trading, we have staff to help you with your next project. Feel free to ask our team questions in store or over the phone. We have helped many customers with their specific design in glass or wire. For those who wish to update or upgrade their existing balustrade, we can assist you in what options are available for your consideration. When you design and install your new glass or wire balustrade, think about what complimentary features you will need to spruce up the area. For example, you will need to consider furniture, the décor, lighting, plants and more. If you have a design in mind, it might be worthwhile showing them to a furniture or garden shop to give you a few ideas. Either a wire balustrade or glass balustrade can make an area look special and the complimentary features will help to elevate the look and feel to a new level. At Keble’s Trading we stock all parts, equipment and tools to construct glass balustrade or wire balustrade. We stock tempered glass panels and standard grade or marine grade stainless steel wire ropes to help you complete your project. Based in Victoria, we continue to serve our customers with reliable, effective and long-lasting products that have been crafted to suit various applications and can be tailored to suit your requirements. Keble’s Trading has the network to source premium stainless-steel products for domestic and commercial projects throughout Australia. We spend considerable time on our sourcing of products from reputable manufacturers to ensure you get a fair price. Our mission is to become Australia’s supplier of choice for stainless steel products, lifting equipment, rigging and wire rope in the construction, infrastructure and engineering industries. If you are in need any glass balustrade or wire balustrade supplies, give us a call on 1800 067 687 or visit us in store. Are you planning to install a glass balustrade or wire balustrade at your home or business? Which do you prefer? Share your thoughts below in the comments section.